The school bagged 10 out of 12 awards, including that of ‘Best Delegation’ beating reigning champions, the All-American Team. 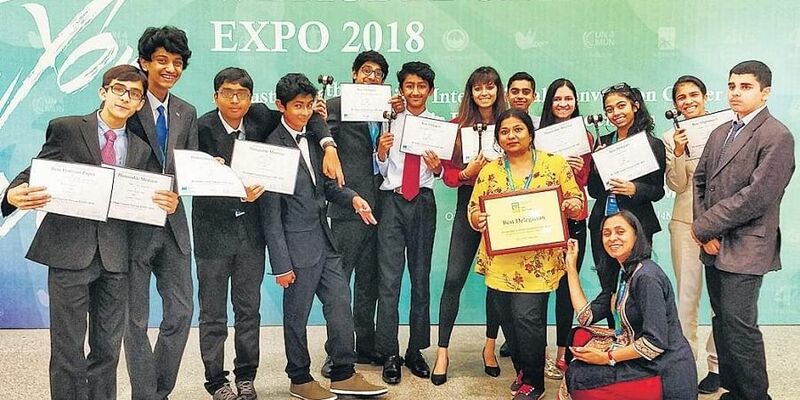 BENGALURU: Students of Inventure Academy have won laurels at the WE Model United Nations (WEMUN) Expo 2018 that took place in Beijing where students from 30 countries competed for the title. The school bagged 10 out of 12 awards, including that of ‘Best Delegation’ beating reigning champions, the All-American Team, who have been winning the title since 2012. WEMUN is the largest permanent Model UN conference in Asia. A total of around 900 delegates participated at WEMUN 2018. Five students – Kaavya Mundkur (grade 9), Dhruv Iyengar (grade 9), Kiara Jacob (grade 9), Arya Murthy (grade 10), Vaania Kapoor (grade 11) – got the ‘Best Delegate’ awards. One student, Anirudh Mody (grade 10), got the ‘Best Position Paper’ award. Four ‘Honorable Mention’ awards were given to Anjali Agarwal (grade 12), Manas Singh Bhati (grade 9), Raghav Chari (grade 9) and Yash Visal (grade 9). Recalling her experience, Arya says that she learnt to work with people from different cultures and sharpened her critical thinking and negotiating skills.